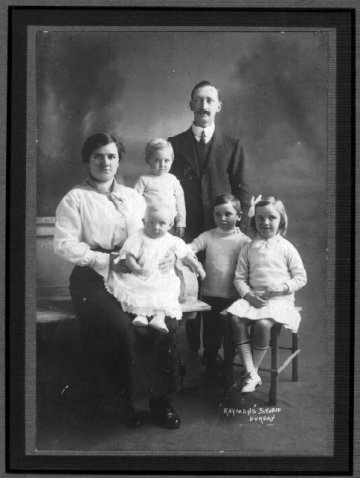 Richard Howard Jelbert was born, the second son of Richard and Helina (Pearce) Jelbert at 2, Jennings Street, Penzance on 3 July 1886. 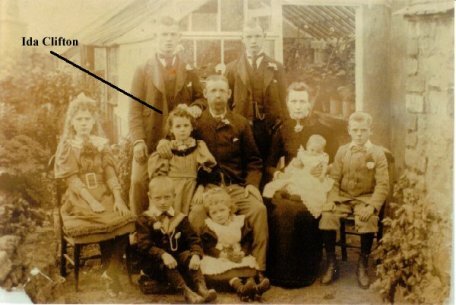 He was the third and youngest child of Richard and Helina (Pearce) Jelbert. The family later moved back to Gulval where he grew up. Richard Howard was an outfitter's assistant of North Parade, Camborne at the time of his marriage to Ida Clifton. He later became a gentlemen's outfitter in his own right and owned his own business in Commercial Street, Camborne. 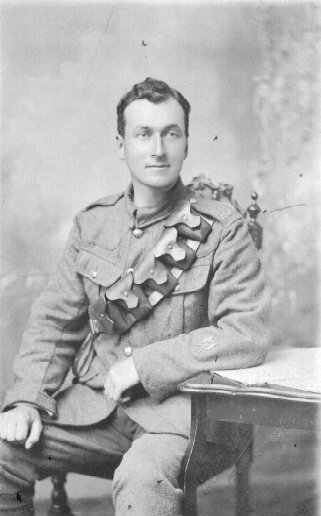 He was in the Royal Artillery from 1917 to 1919 and served in Belgium and France in the rank of Gunner. During WW2 he served in the Home Guard in the rank of Colour Sergeant.  He retired in the early 1950's and died at Camborne at the age of 75 on 4 September 1961. 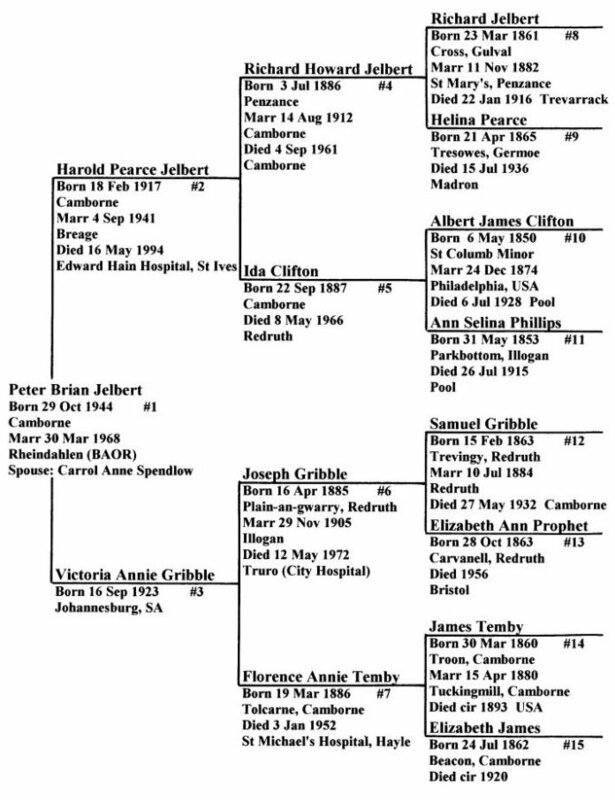 The following link will enable you to download a file (.rtf format) containing details of the Gulval/Madron branch of the Jelbert Family which dates from 1605 when Joh'es Jelb'rt was baptised at Gulval. The burial of his father (Jacobus (James) Jelbarte) is also recorded in the same parish records on 26 February 1615/16. 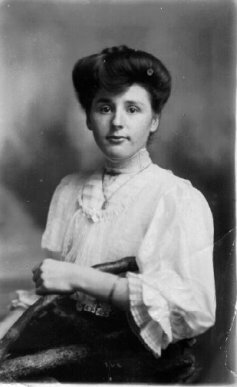 Ida Clifton was one of ten children born to Albert James and Ann Selina (Phillips) Clifton. She was born at Dolcoath Road, Camborne, on 22 Sep 1887. Albert James and Ann Selina, both of whom were Cornish by birth, had emigrated to the USA and married in Philadelphia on 24 December 1874. They later returned to Camborne. Albert James was a builder by trade. He built houses in the Camborne/Pool area, many of which are still standing today. 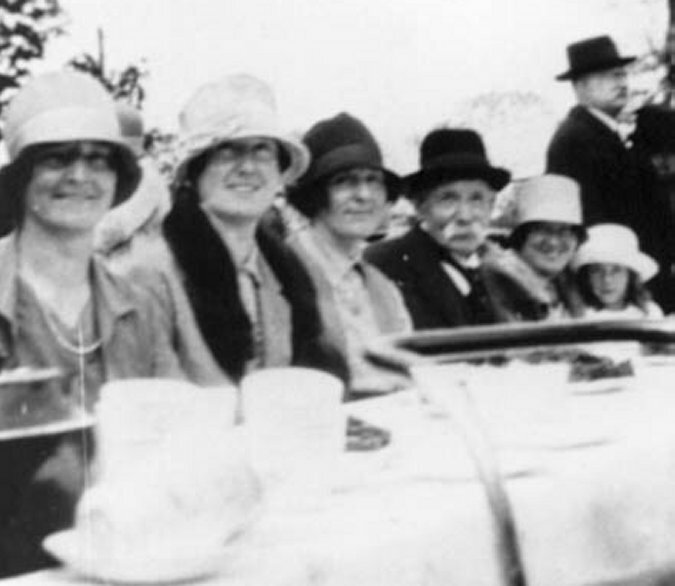 The Whit Sunday Tea Treat, Camborne, 1928. This link will enable you to download the ancestry (in .rtf format) of the Clifton Family of Week St Mary and Camborne, dating from about 1602. I am indebted to John (Jack) W Clifton of Florida for much of this information. Jack, who lives in Florida, is my second cousin, once removed. 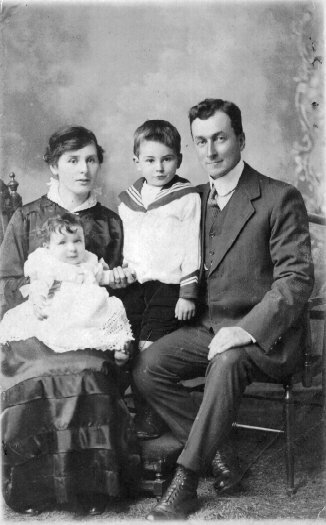 and father, Samuel - 1910 Joseph Gribble was born at Plain-an-Gwarry, Redruth on 16 Apr 1885. He began his working life as a butcher's boy but went to Johannesburg, South Africa, to join his father at the age of 17. 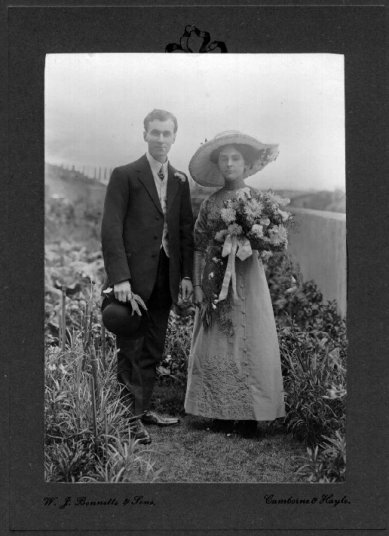 He went back to Redruth to marry Florence Annie Temby in 1905 and they returned to South Africa shortly afterwards. Joseph & Florence Annie stayed in South Africa for almost 20 years. They had 8 children, one of whom died in South Africa. The family returned to Camborne shortly after in 1925. Whilst in South Africa Joseph worked as a mining engineer and self employed agent for Holman Brothers, selling mining equipment. 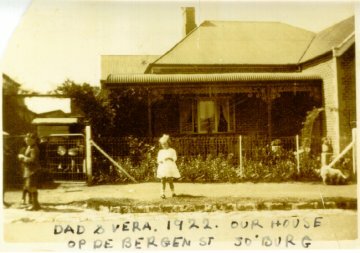 Their adddress in the 1920's was 96, Op De Bergen Street, Fairview, Johannesburg. Joseph died on 12 May 1972 in the City Hospital, Truro, Cornwall. You can access the file of my Gribble ancestry (in .rtf format) through this link. 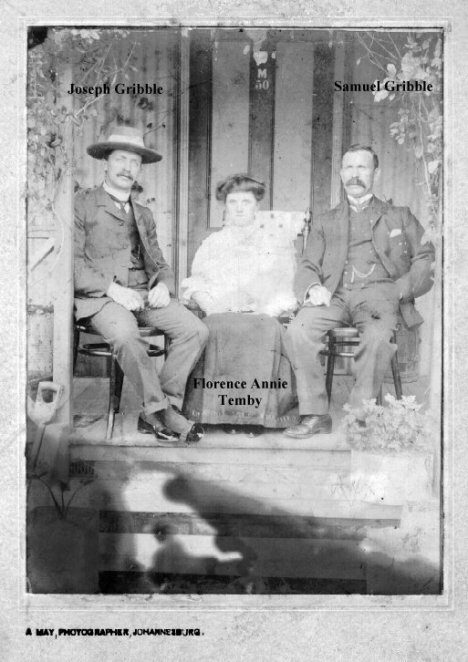 Florence Annie Temby was born at Tolcarne, Beacon, near Camborne on 19 March 1886. She was the third (of four) daughter of James & Elizabeth (James) Temby. James, who was a tin miner, died in the USA in 1893 when Florence Annie was only 7 years of age. The picture below shows the Beacon Chapel Choir outside Beacon Sunday School before the annual outing to the coast in 1908. 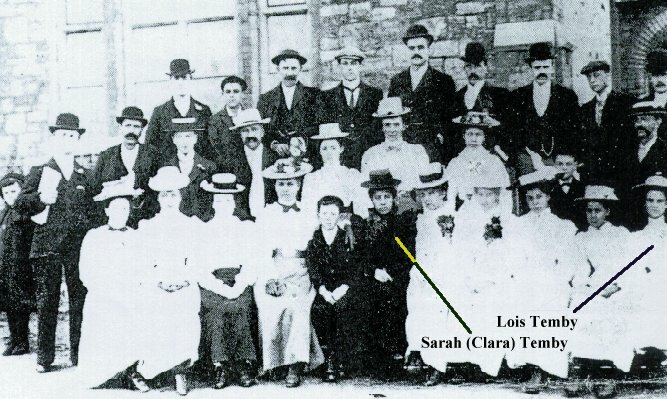 Sarah (Clara), who is in mourning, and Lois are Florence Annie Temby's sisters.